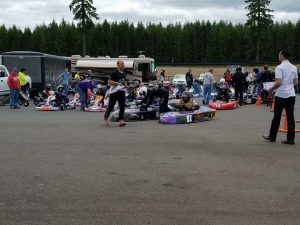 The 2017 IKF Road Race Grand Nationals will be hosted by the Puget Sound Road Race Association during the first week of August, and based on the continuingly increasing numbers at the club’s recent races at The Ridge Motorsports Park in Shelton, WA, the annual IKF Grand Nationals could see its best numbers in many years when it takes its turn at The ‘Ridge’. The PSRRA held the first race of their 2017 season at the facility on June 2-3 and drew almost 190 entries for what was an extremely successful weekend. The event started out on Friday with a bit of a damp morning for the drivers meeting that was held ahead of practice. As the morning progressed, the rains cleared, the sun came out, the track dried, and low and behold, the speeds increased as the asphalt warmed up. The practice for the PSRRA event was split with The Ridge’ s ‘Test and Tune cars’, so each group had 30 minute sessions throughout the day. Everyone had plenty of seat time! After the track went cold for the day, the fun moved over to the Olympic Grand Prix sprint track for the concession kart endurance race, where eight teams battled for the title on the sixth-mile kart track, which is an exact replica of the big track at the Ridge! Following the endurance battle, the PSRRA organized a BBQ Potluck. The PSRRA provided burgers, hot dogs, and brats, which were accompanied by many delicious side dishes provided by the racers and their families. A good time was had by all. Saturday was a dry day and featured a record breaking turnout for the club with 189 entries. The grids were full of karts and the racing on-track was extremely good. The club leadership of Aaron, Lisa and Brittany Stanford work extremely hard to make sure the PSRRA races are a lot of fun and they’ve put in the time to try to grow the sport of road racing in the Pacific Northwest. To their credit, there were a good number of first-time road racers in attendance for the first race of 2017. There were new and old racers battling around the track, which made it a lot of run for those watching from the sidelines. TaG Light went to Brittany Williams ahead of Dimitri Artimenia and Wade Jansen, while the Formula 125 Limited battle was won by James Frances, who topped Dean Faciane and newcomer Andrew Byrne. Williams also won TaG Heavy, beating Wade Jansen and Chris Gasaway. John Benson scored the win IKF intercontinental E/ICE over Jim White and Tom Rice, while in the second E/ICE race, Chuck Gilbert was victorious over Rice and Vance Johnson. The IKF Briggs World Formula classes had solid double-digit turnouts as well, and in the 18-entry Medium class, veteran Don Holmboe won over Steve King and Bryan Green. In Heavy, 17 karts took the green and it was Corey Marcum crossing the line with the victory over Chris Passanante. Holmboe scored a pair of podiums with a third-place run in Heavy. Jacob Delavergne beat Paul Goldman and Frank Ross in Superstock CR 125 Heavy, which was one of the largest classes of the day with 17 drivers. 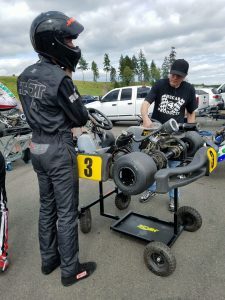 In Superstock CR 125, Chris Hegar won both races in the formula, outrunning Rob Hegar and Frank Toss in one race, and James Frances and Rob Hegar in the ‘West Coast’ class, which gives drivers two chances to race in the same kart. The PSRRA also had a solid 80cc Laydown turnout with nine karts hitting the track, and Blair Nelson won at the Ridge over Martha Morse and Russ Dyer. In the Formula 125 class, Andrew Byrne scored in his PSRRA debut over Monroe Jordan, Travis Henson, Aaron Stanford and Vance Johnson. With the race in the books, the PSRRA crew has now gone right into ‘full Grand National mode’. Among other highlights, the organizers have confirmed that SwedeTech Racing Engines will be on hand for the Grand Nationals in August to support their customers. The Stanfords continue to work hard to sign more class sponsors, and the calendar for the daily activities after racing each day is still being planned. They’ll have another potluck BBQ and there will be a pit area decoration contest with cash prizes. Daily raffles for cool gifts and baskets are planned. They are also working to get live music for dancing, and face painting for the kids, as well as a bouncy house for the younger kids and a kids versus adults water balloon battle. They are going all-out to make this a great family event. If you have any questions or sponsorship inquiries, contact Aaron Stanford (206-398-9758 or Stanracing@gmail.com). Following the IKF Grand Nationals, the PSRRA will head to Spokane Raceway Park on August 26-27 for the second stop on their race calendar.